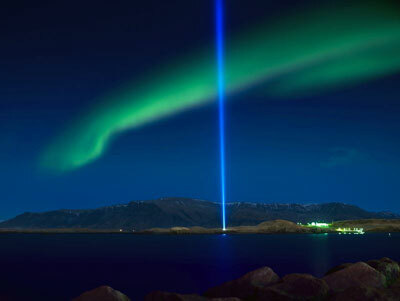 Yoko Ono will be in Reykjavik, Iceland to light up the Imagine Peace Tower tomorrow night. The tower is lit each year from October 9, John Lennon’s birthday, through December 8, the date he was shot. The Tower consists of 15 searchlights with prisms that act as mirrors, reflecting the column of light vertically into the sky. On a clear night the light is said to reach 13,000 feet. On a personal note, Liz and I were married in Reykjavik one year ago tomorrow, so we like to think the light also marks our wedding anniversary. Today we have the song Tin Anniversary by The Gazetteers. Happy Friday!